Easy and healthy dinner appetizer in minutes! The FTLOC Vegetable Spiral Slicer brings you countless food ideas, today let's make one of the easiest vegetarian appetizer. 1. Wash the romaine lettuce, the cucumber and the carrot thoroughly. 2. Peel the carrot and use the FTLOC Spiral Slicer to slice the carrot to desired length. 3. 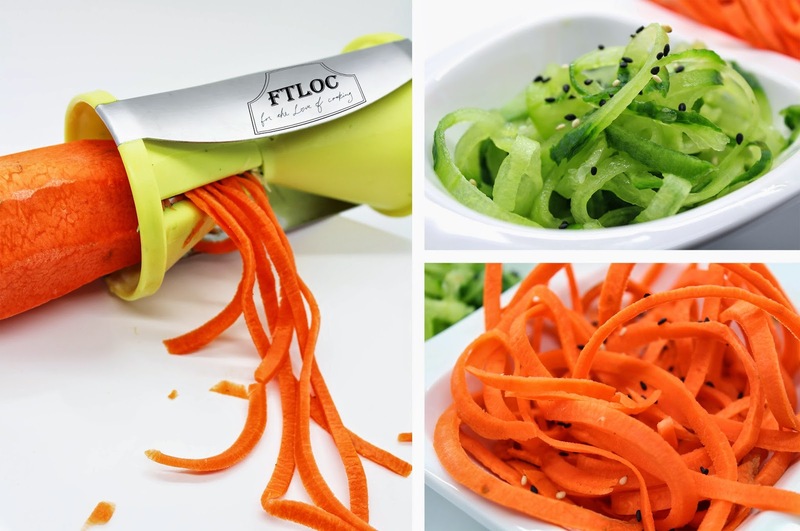 Use the FTLOC Spiral Slicer to slice the cucumber to the same length as the carrot. 4. Add black sesame and spicy soy bean sauce on top of the vegetable strings. On a side note, it is highly recommended to use the FTLOC Lemon Sprayer to add a fresh mist of lemon to the wrap. Not only will this make the wrap taste better but also add vitamin C to your food! Hope you enjoyed the simple recipe, be sure to come back for more recipes and great kitchen tools!